What is happening at SODO, South of Downtown Orlando? September 20, 2018 – Hear the latest news from Lisa Holaday, SODO real estate specialist. SODO is a business district, thriving with many historic neighborhoods. Orlando Health is conveniently located in SODO and is one of Orlando’s most established hospitals, right near Downtown Orlando. Lisa is very active in the SODO District and is a resident of SODO herself! 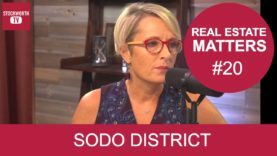 Watch to learn more about SODO from Lisa!